Springtime has been particularly wonderful this year at COT. Not only have we been treated to the all the usual natural delights of our countryside surroundings, but it has also brought many opportunities to spread the word about our amazing charity. 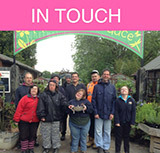 The Bluebell Cream Tea, Poulton Wood Open Day, Care Services Open Day, Beaney exhibition in Canterbury, Wealden Fair and Heathfield Agricultural Show have all been fabulous opportunities to showcase our work and give the wider community a sense of what makes us so special. Spreading that message is essential, as it helps us garner the public support that we really could not do without. Helping our current and potential future supporters to know and love us as much as we do is a key part of our work. Luckily, we rarely have to try too hard – our incredible service users and their many achievements speak for themselves. A very visible sign of the faith our supporters have in the work of COT is the rapidly emerging outline of the new Life Skills Academy – look out for the article on pages 16 and 17 which highlights the enormous debt of gratitude we owe to the individuals and organisations who believed in our vision and helped to fund the project. With just the equipment left to fundraise for, we are almost at the finish line on a long but extremely successful campaign. Reaching this point is, however, a bitter-sweet time for me as it means that I must finally let Angela Phipps move on. You may recall that she actually ‘left’ over 18 months ago, but was persuaded to give ‘just a few more weeks’ of her time to help us raise the build costs for the Academy. That she stuck with us when those weeks turned into months is a measure of her loyalty and dedication. I have spoken before in these pages of the hole that Angela will leave behind her at COT. The new Academy – which will make real difference to the lives of so many of our students, now and into the future – changed from vision to reality because of her considerable efforts. I cannot think of a more fitting legacy for her time at the Trust. Finally, I’d like to highlight a project that may be of interest to many of our In Touch readers. I have been fortunate to be invited, along with our service user Ben Hillman, to join the Steering Group of a research programme currently being undertaken by the learning disability specialists at The Tizard Centre (part of the University of Canterbury). With funding from the NIHR School for Social Care Research, they are exploring life skills training programmes through a range of discussions with service users, family members and service providers. They are seeking to find out who attends these programmes and to learn more about their experiences, the benefits, barriers and outcomes. Although a number of Canterbury Oast Trust parents kindly agreed to attend a Focus Group meeting for family members in June, there were not sufficient numbers to make the meeting viable. The researchers are hoping to reschedule the meeting later in the summer and I do hope that those who have not already signed up might consider getting involved. The project has the potential to be enormously useful in helping to make the case for continued funding for day services, so we are throwing all our support behind the researchers and their work. Those not able to attend a meeting in Canterbury can opt to have a one-to-one discussion in a location of their choice instead – there is lots of flexibility. If you are willing to take part, please let us know – I know the researchers would be very keen to hear your views.